I’m pretty excited to announce that there is a new linkup on Deb Runs. Every Wednesday, the lovely Deb will be providing a word about which to blog. Kind of like a nice little blog prompt. Posts can be fitness or health related, but don’t have to be, so really anyone can play along. Just be sure to link up with InLinkz on Deb’s main post, and share the love by reading and commenting on other’s participant’s posts. 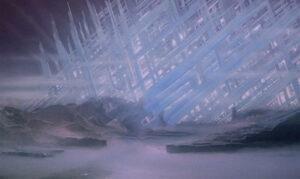 I mean, nothing says “solitude” quite like the actual “Fortress of Solitude,” am I right? And then interestingly, my brain flicked to the movie Interstellar, which we watched the other night. There is a scene in the film, a cut, really, where the camera transitions from the action and dialogue inside the shuttle, to the exterior of the ship. There is nothing but dead silence, and all this vast, black space. For some reason, I felt this horrible weight on my chest, the most oppressive feeling. It was the utter definition of solitude. I’m pretty ok being alone. I love being out with Mr PugRunner or friends, but I also love sitting at home with a glass of wine and a fabulous movie or great book. I don’t mind eating out as a party of one, or going to the movies on my own, and we all know I am incredibly comfortable running by myself. But I look at that as more time to myself, rather than actual “solitude.” In fact, I don’t think I do solitude very well at all. My perception of it is something isolating and crushing, rather than peaceful. Suffocating and lonely. Not for me, one bit. What does the word “solitude” bring to mind for you? Do you like being on your own or do you prefer the company of others? Answer in the comments or write your own post on the subject! Make sure you link back to Deb Runs! Thank you for linking up to my very first Wednesday Word! I love seeing everyone’s interpretation of solitude. Sorry it was so late! Busy day! I actually look at solitude as a positive thing. I don’t get much time by myself, so I enjoy it.